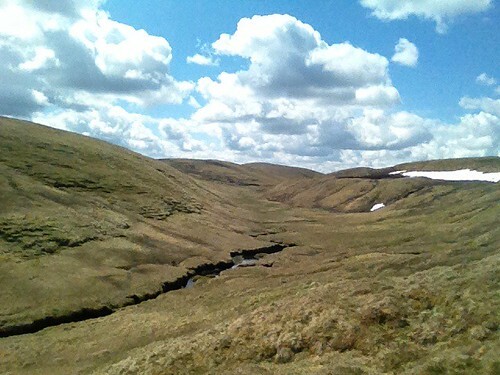 With Scotland basking in the sunniest spell I can remember since last May, there was no alternative but to head to the hills and take advantage of the unseasonable warmth (our summer's usually over by May, isn't it? ) 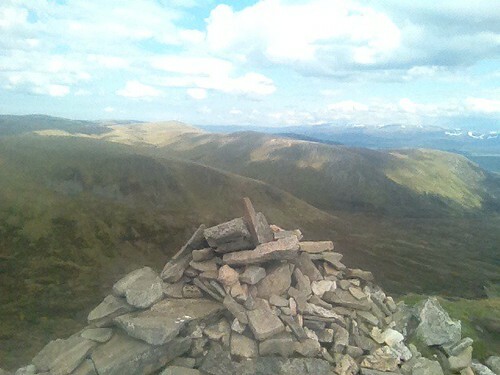 After a wonderful day in the Luss Hills the week before, I felt it was time to finally kick on with the Munro-bagging. 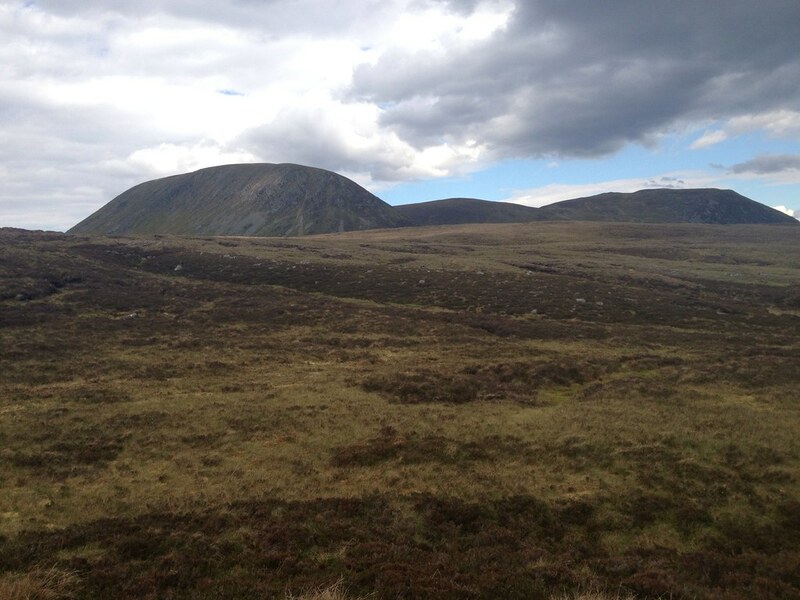 After scouring the popular routes I eventually settled on a visit to the Monadliath, and the long circuit of A'Chailleach, Carn Sgulain and Carn Dearg. I'd never climbed three Munros in one day before, but Carn Sgulain sounded like a bit of a skoosh and I would have the fenceposts to guide me to Carn Dearg. 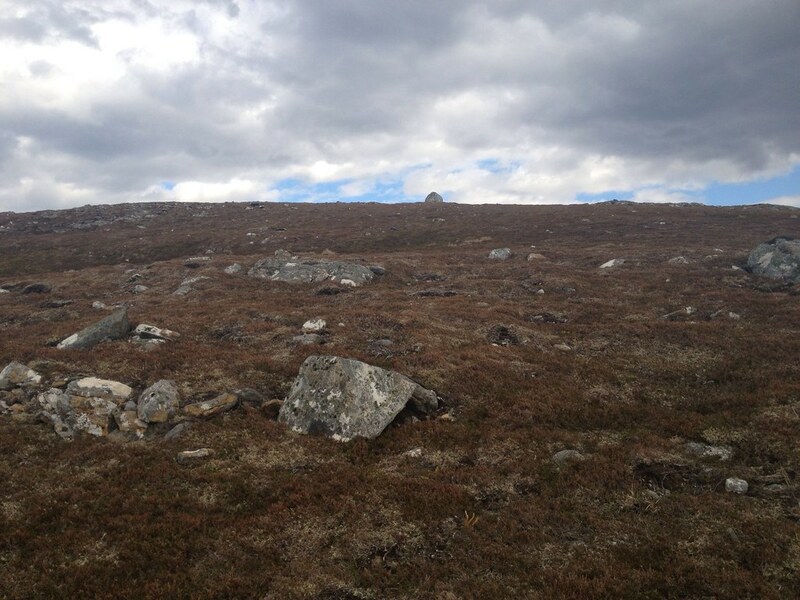 To my surprise, in the final days before the climb I found that a Graham sits at the end of this route, as climbed by Rockhopper and Johnny Corbett. Sold. 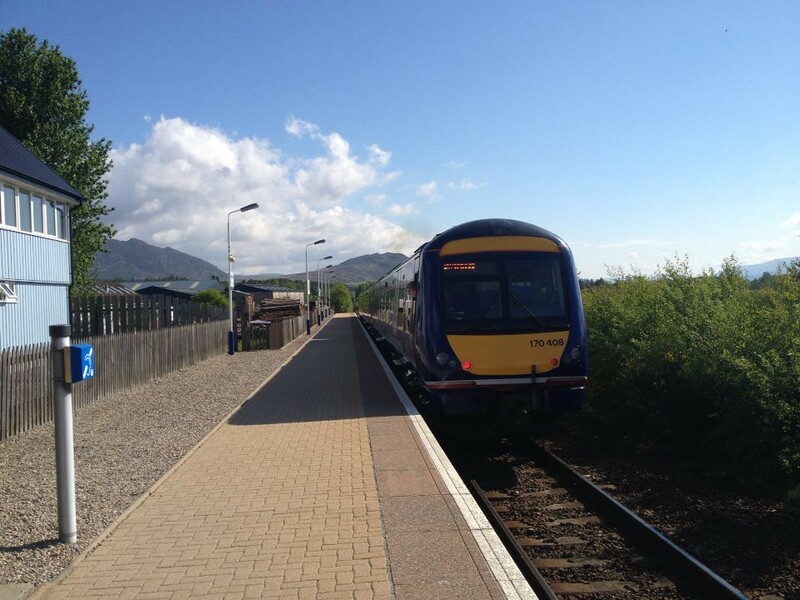 Get me on the next train to Newtonmore. 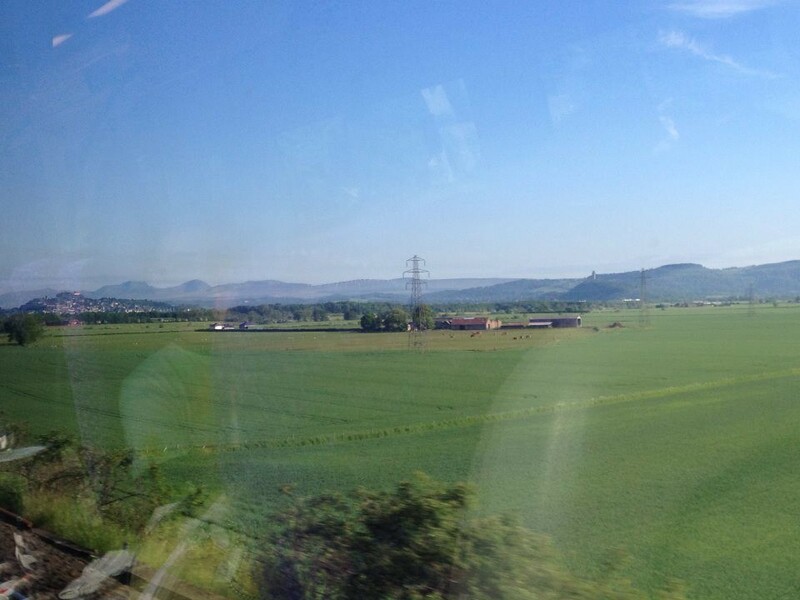 The 7:10am train from Queen Street was fairly busy with hillwalkers and Rock Ness music-goers. 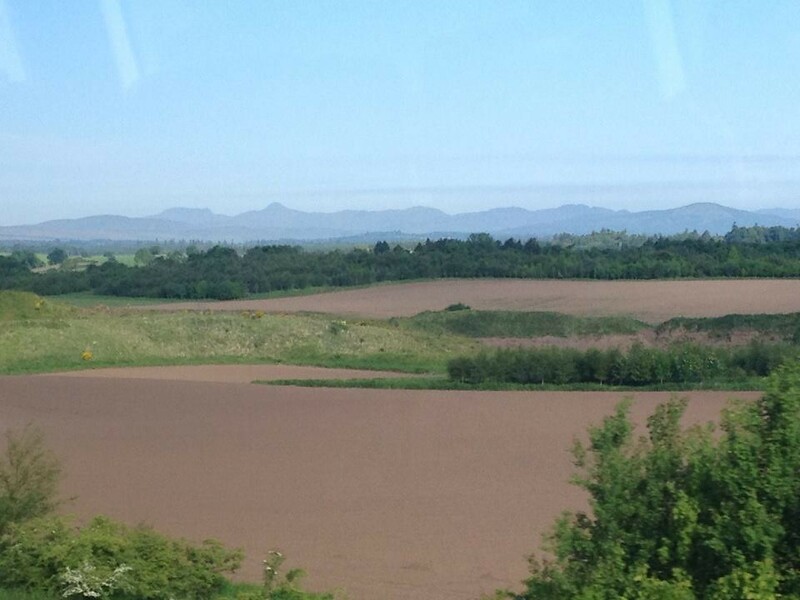 The views started to open out around Stirling, with Stuc a'Chroin and Ben Vorlich in front of the Castle. 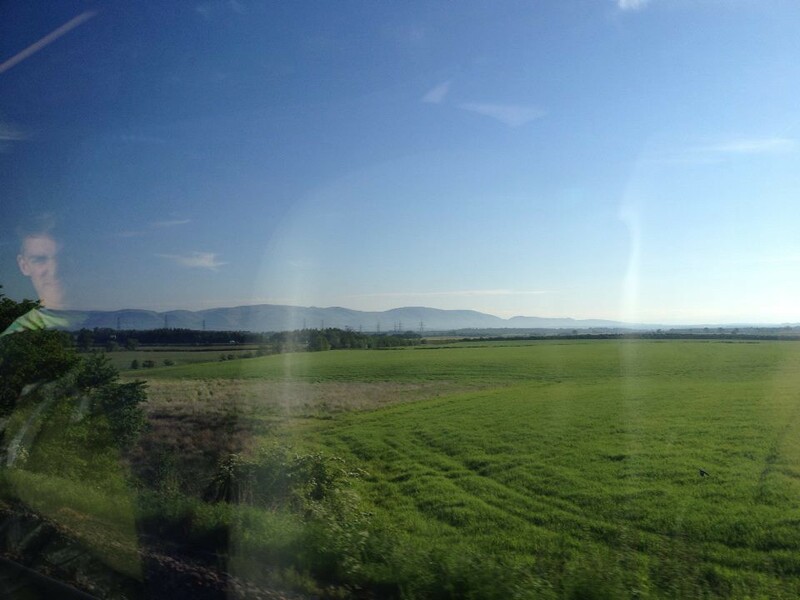 A ghost observes the cracking view of the Ochils. 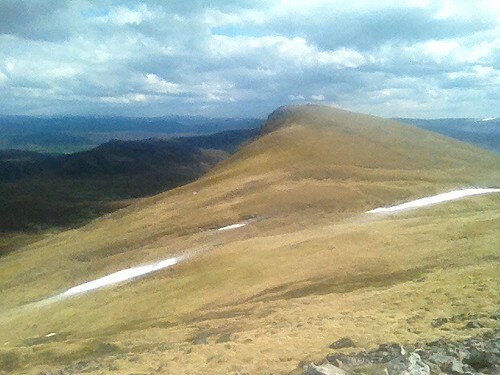 Vorlich and Stuc A'Chroin were clear as day for much of the journey. I'm not sure of the names further East. 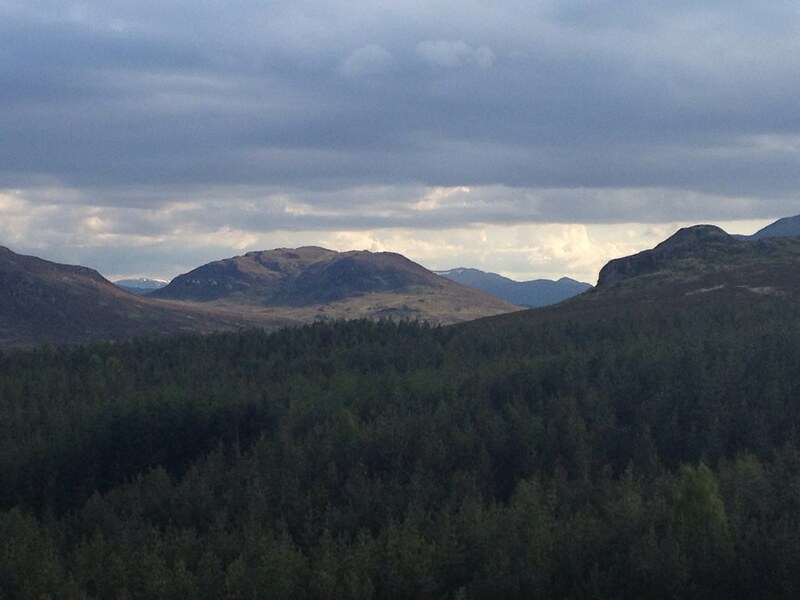 Ben Vrackie standing tall above Pitlochry. Dalwhinnie looking a fair bit nicer than the reputation suggests. Maybe because of the sunshine and the promise of whisky! 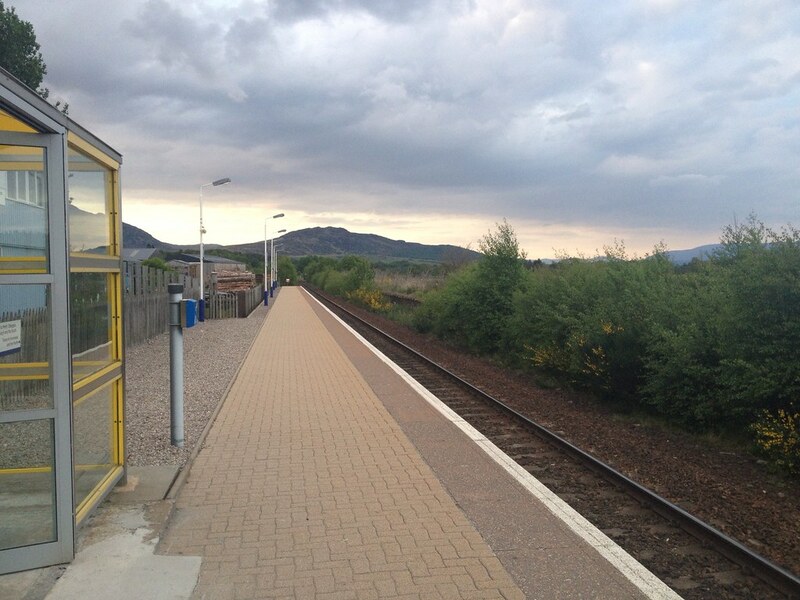 After a journey approaching 2.5 hours, I was ready to go at Newtonmore. The route took me up past the edge of the town, through a thin path that weaved between houses and up onto a large grassy area following the Calder Path. 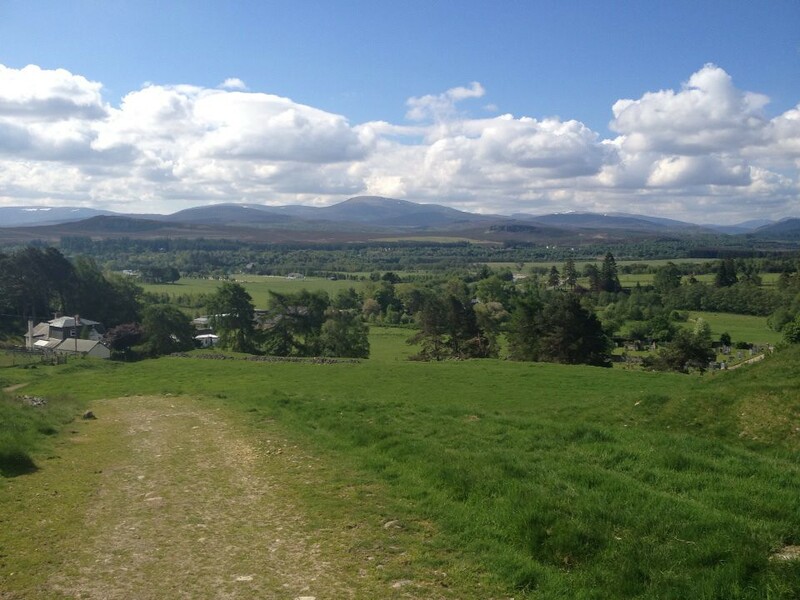 Things had started to cloud over after Blair Atholl, but it was brightening up again, much to my joy. I've not had too many torrential downpours on my walks so far, but it's still unusual to see blue sky in so many directions. My favourite kind of horses are Caution Horses, ideal for showing calm and restraint at tough moments. 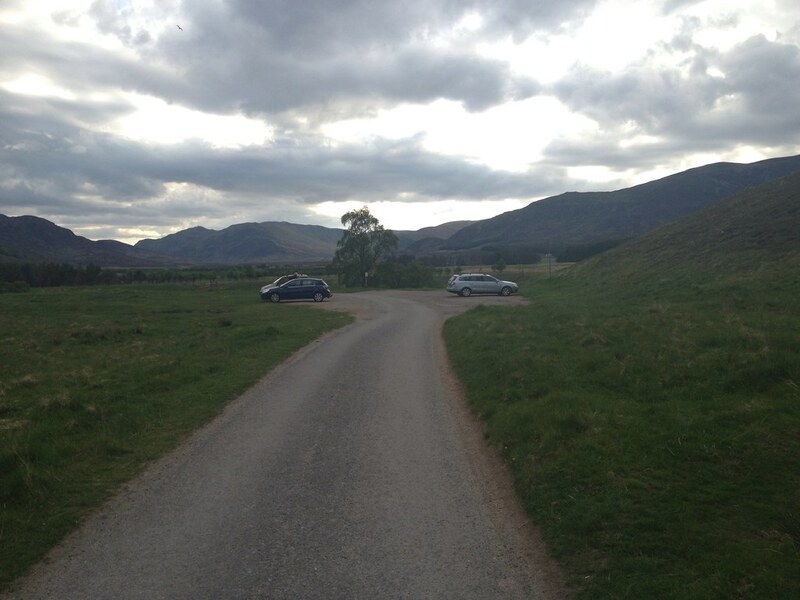 Eventually the grassy path led to the road, which I followed round to the car park in Glen Banchor. 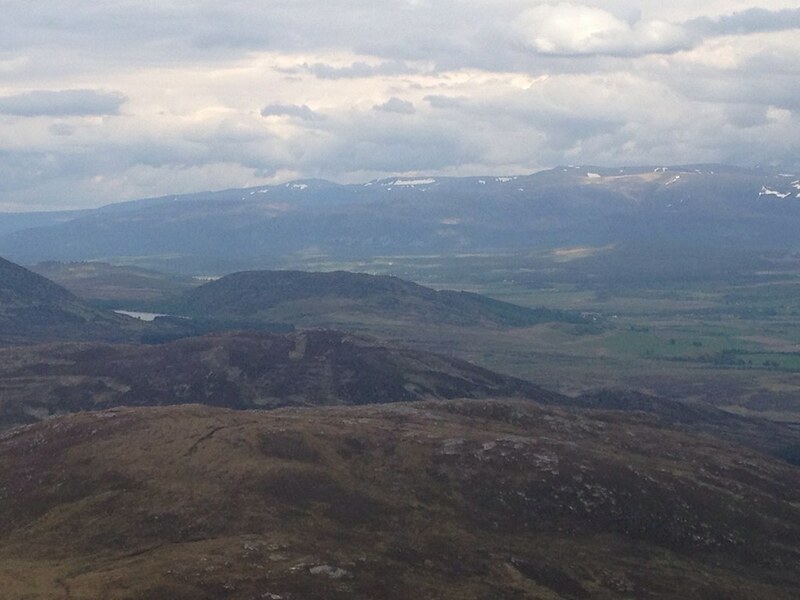 The views here were great, with the Graham of Creag Dhubh opposite and the Monadliath closing in from the North. Leaving the car park just after 10am, I headed North up the clear track beside the Allt a' Chaorainn. 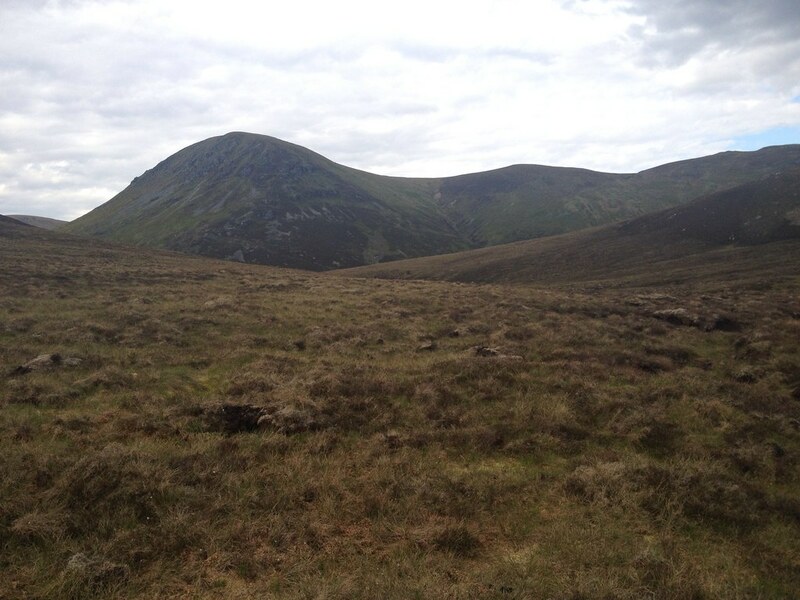 The going here was easy, with a gentle incline easing my introduction to the Monadliath. 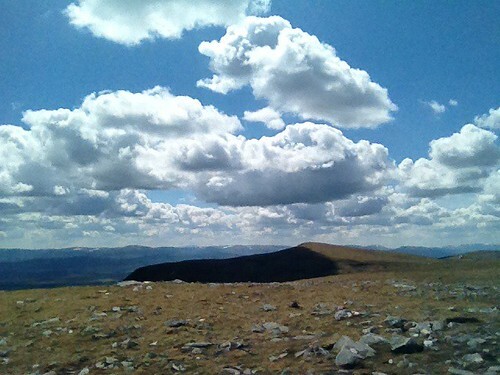 I had never gone hillwalking North of Corrour before (save for a morning on Barra! ), so I was initially quite daunted about coming to an environment vastly different from the hills of Arrochar, Luss, Arran or Galloway. 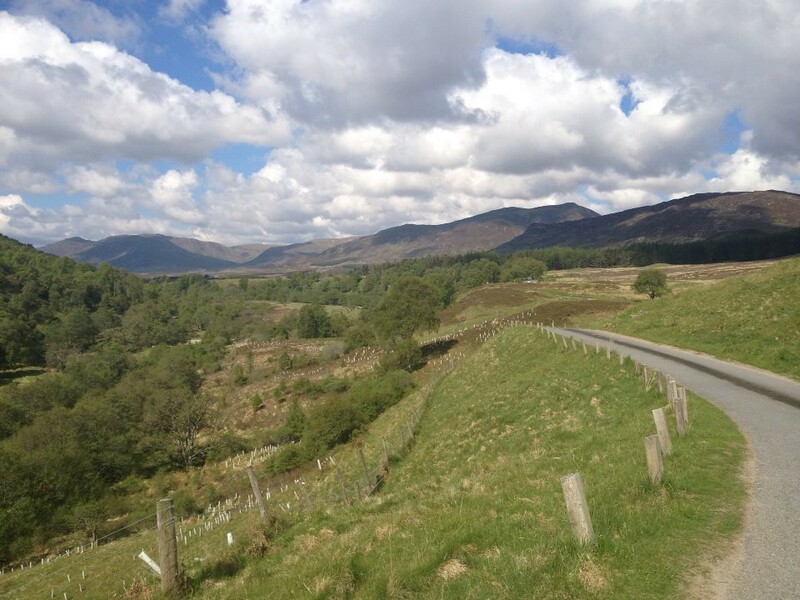 The quality of the track was thus a big bonus as I got to grips with a new Highland landscape at last. Then the track gave up just before a fence. And it got a wee bit problematic. 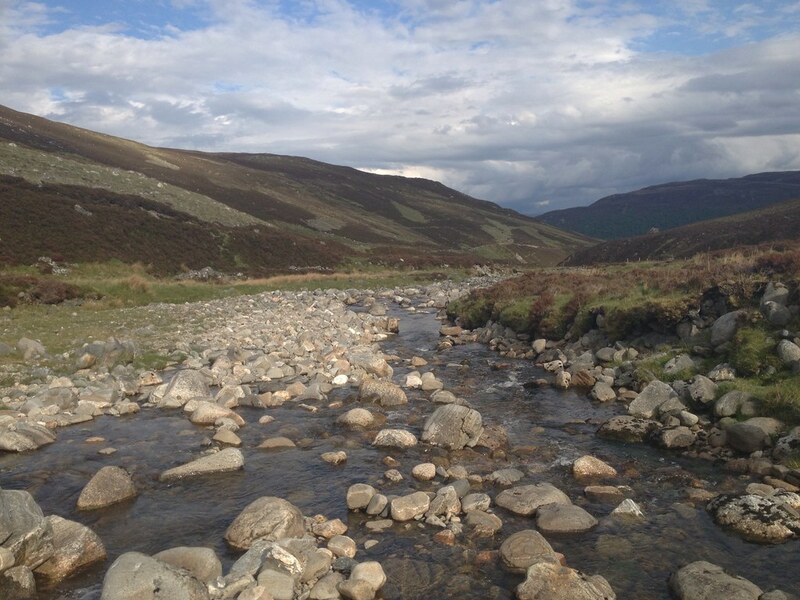 I knew the Allt a' Chaorainn would have to be forded, and with a complete lack of rain in the last week, the Monadliath were as dry as they were ever likely to get. But a river crossing is still a river crossing, and I'm not too keen on them under any circumstances. 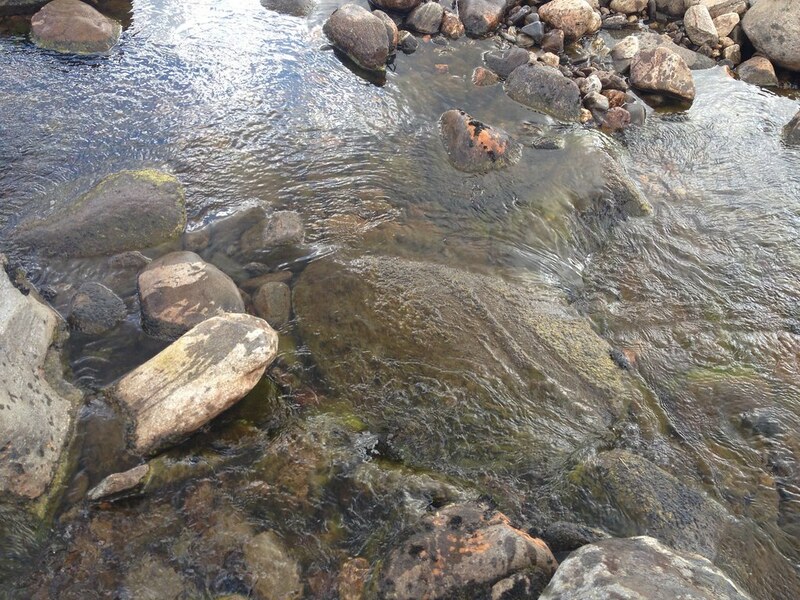 But having endured a 90-minute river slalom on Ben Vorlich last year without slipping, I assumed nothing would go wrong. Probably. Damnit. Always thought that rock looked too slippy. I fell crashing into the river, thankfully with no-one around me to witness the carnage or hear the yelping sound I gave. Picking myself up as quickly as possible, I could tell that my trousers were soaked, my brand new map was soggy and I had a sore backside. But worst of all, I had kept my phone in my pocket all morning. Surely the iPhone 4S could withstand a second or two of brief water damage in a low stream. 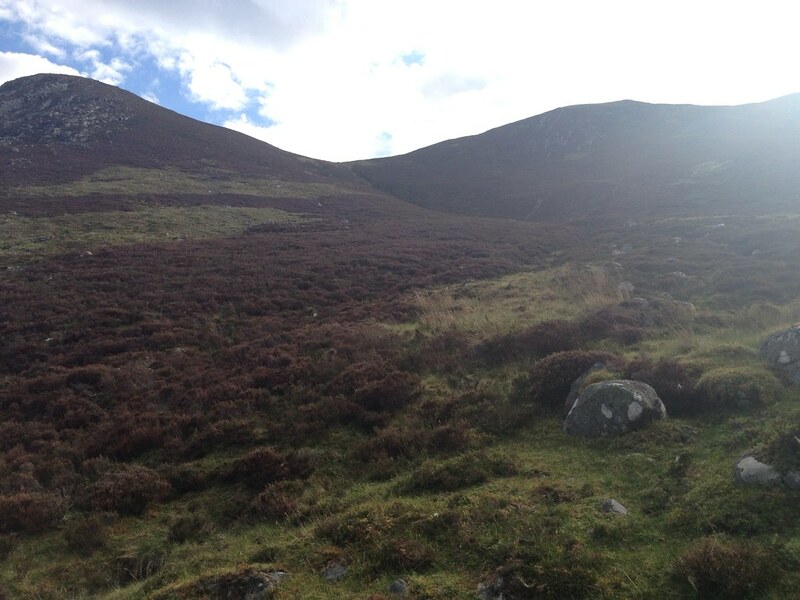 I stumbled up the hill, locating a faint path that headed towards the bothy on the eastern slopes of A'Chailleach. Thankfully my trousers would dry out in the heat and...hang on, there's something a bit wrong with that photo, isn't there? 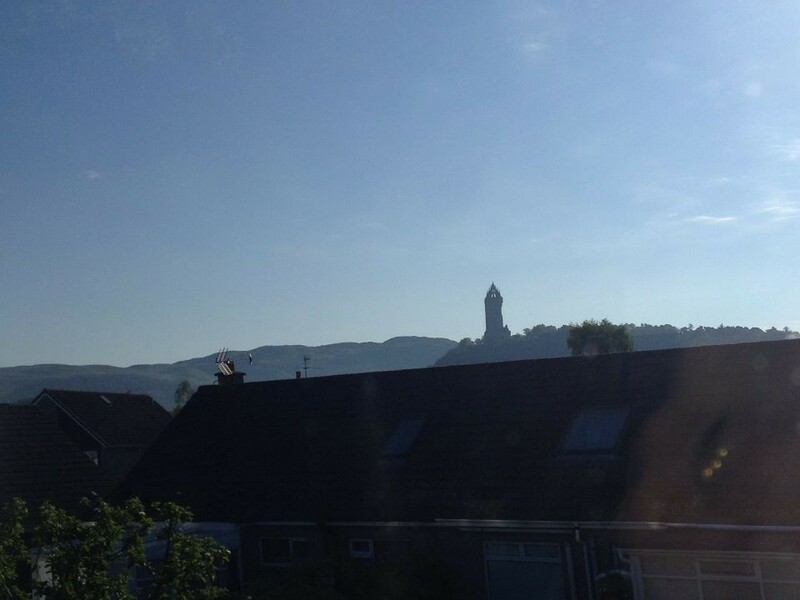 It's not misty today: in fact, far from it. Oh crap. The phone was damaged alright. Worse than I'd originally feared. 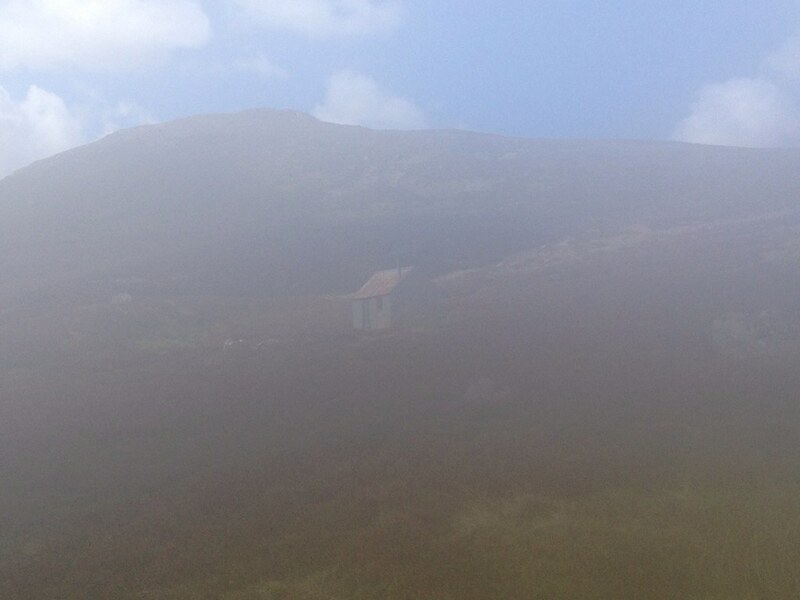 With my iPhone now claiming I was surrounded by an enveloping rainstorm, I had no option but to scurry up the steepest part of the hillside, and try to reach the summit of A'Chailleach for a psychological boost. A father and son from North-East England had been waiting outside the bothy: they probably thought I was mad when I stumbled past them, babbling incoherently about Apple in my drenched clothes. Still, the sun was shining. And that is a good thing. Mercifully, my other camera on the front of the phone was still working, albeit at a much lower resolution than the back one. I would just have to bumble on for the next few hours with these inferior 1970s-esque photos, much like the court report on Chewin' The Fat when the job of Acting Sketch Taker was carried out by a Police Constable who did cartoon drawings of suspects shouting, "Mon then!" 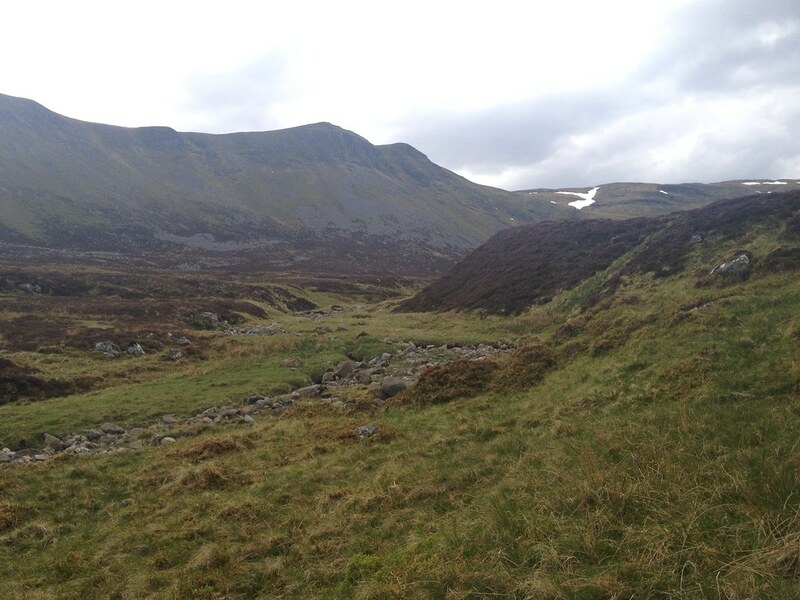 The OS Map suggests that the A'Chailleach path heads North-West up to the bealach before turning right for the summit, but from the valley I could see a clear path heading straight up the South face to the summit. Right enough, the faint path from the bothy led me across a gully to this more distinct path, making an easy decision even easier. 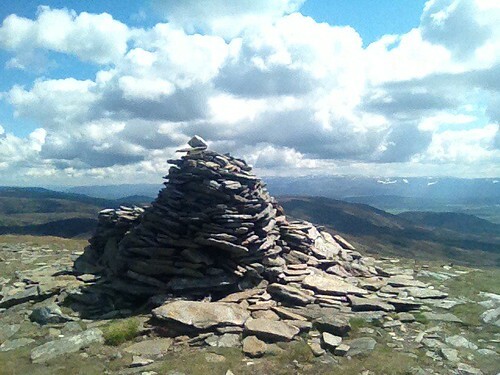 The path looked steep at first, but it posed few problems in the clear conditions, and before midday I was at the summit of A'Chailleach, remarking on the great weather with another group and admiring the giant lion-like cairn. 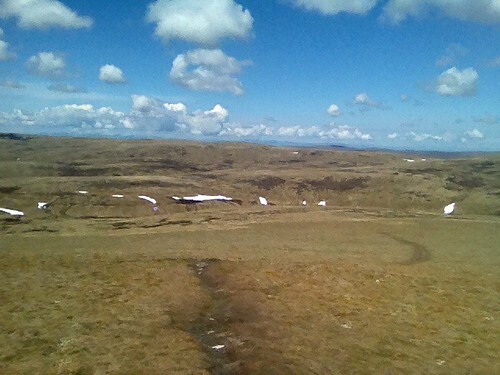 Across the valley to the North stood Carn Sgulain. 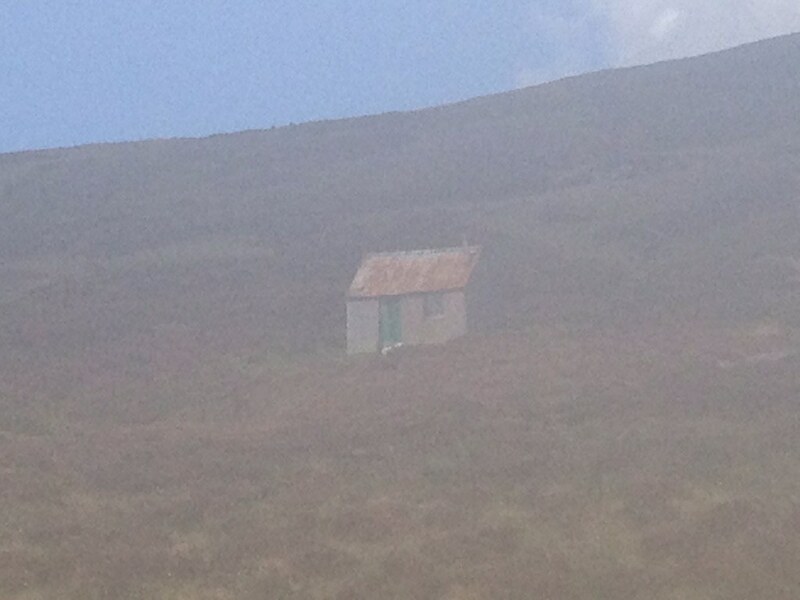 Well, somewhere in this vision of high rolling moorland. 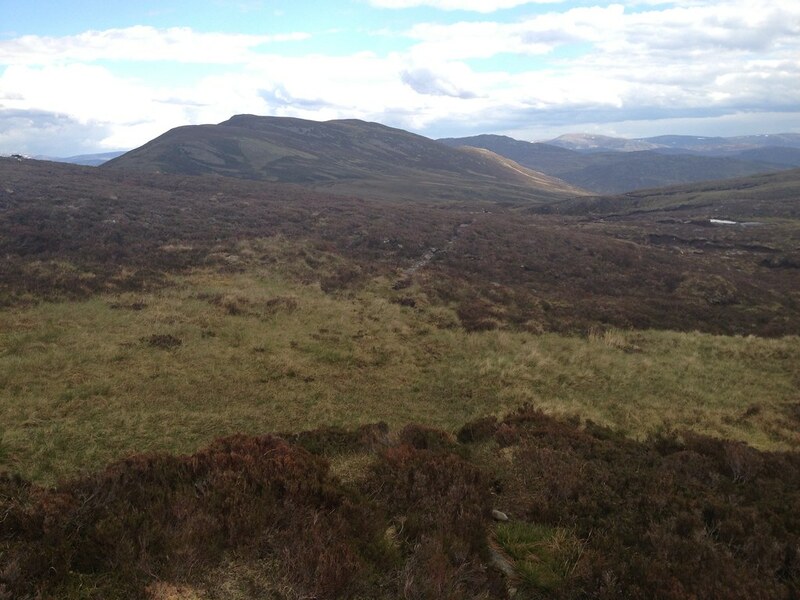 I can hardly describe myself as a snob when it comes to Munro-bagging: A'Chailleach was only my dozenth. But I'm not quite sure if Sir Hugh was on the sauce the night he added Carn Sgulain to the list, or something stronger. 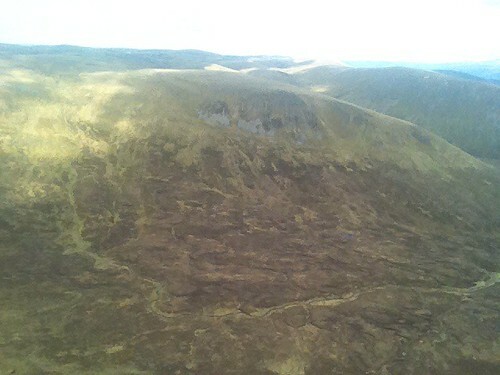 Neither A'Chailleach nor Carn Sgulain are even Marilyns, falling well short of the 500ft drop to Carn Dearg to the West. But at least A'Chailleach has something of its own character, requiring a 5-mile-plus walk to reach the next highest Munro. And, well, it looks nicer. 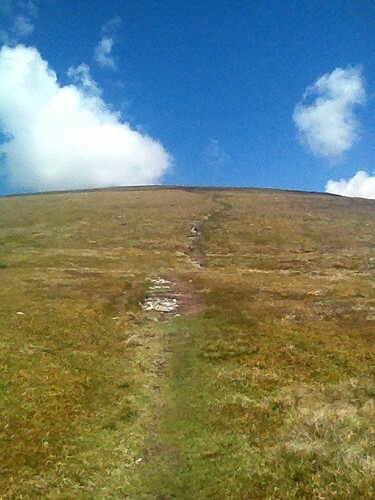 Carn Sgulain is barely a mile away, and only needs a 98m climb from the gully. But still, a win's a win, and I'd hate the SMC to take it away just because of snobbish attitudes towards what constitutes a 'good hill'. 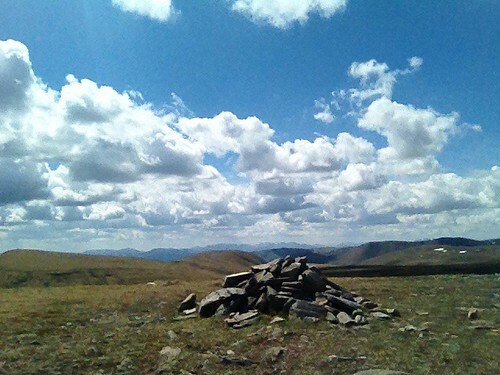 To my mind, any time I reach a summit and get a grand view, it's a good hill. 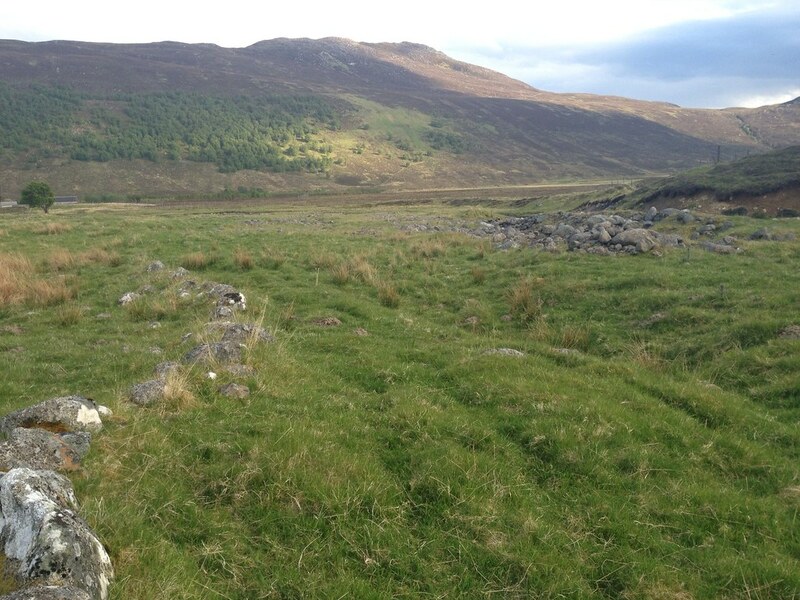 I found that the path seemed to disappear in the gully between the two hills, but in the clear weather wayfinding was simple enough, and I curved round the edge of the adjacent hill to emerge at a high bealach near the fenceposts. 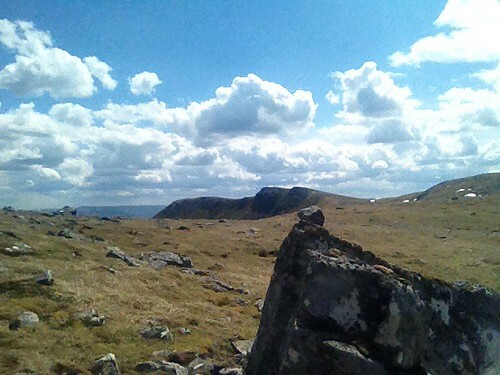 Carn Sgulain's dual summits were only five minutes away, and as I sat on the furthermost one having lunch, I debated with another couple of Englishmen which summit was higher. Their GPS was telling them the furthest one is higher, but my OS seemed to suggest it was the closer one. Either way, we saw a wild panorama of high plateaus and moorland to the North, sat atop one of the easiest Munros you're likely to find. The total time between the two summits must have been no more than 40 minutes. 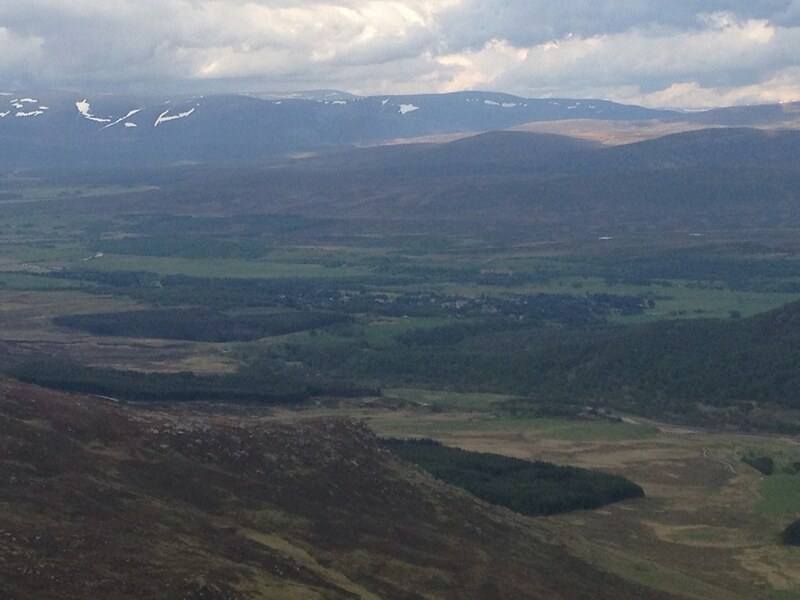 A'Chailleach from Carn Sgulain, with the Cairngorms behind. 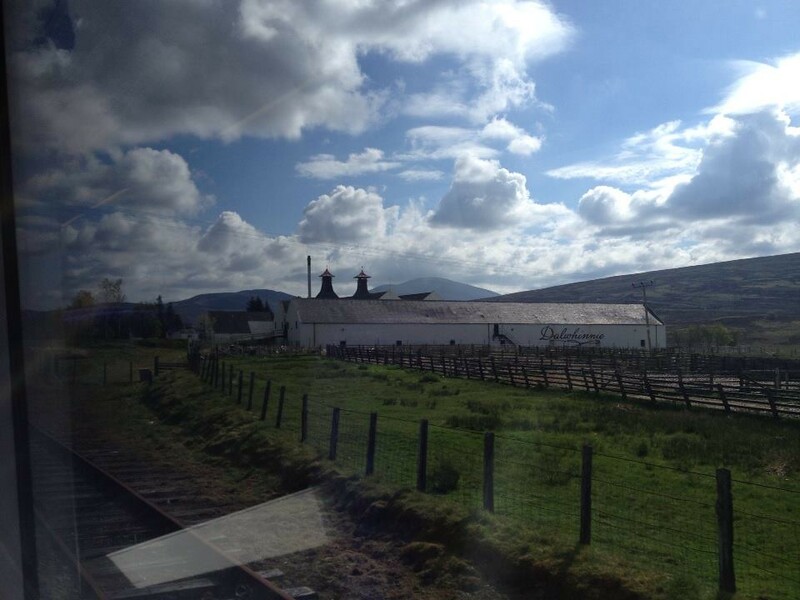 From here, the fenceposts led the way on a two-hour whistle-stop tour of the Monadliath. The week before I found that a similar line of fenceposts helped me to climb Ben Reoch (very useful for leaning on, I found), but on the flat Monadliath there is no such need for support. In both cases I was left bemused as to where and why the fence has disappeared. 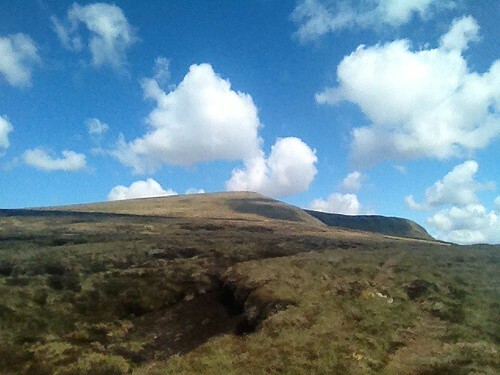 Upon leaving Carn Sgulain, my battered and bruised iPhone was already down to 32%, partly because of its tough morning and partly because its battery is utter rubbish. I had no alternative but to put it on flight mode, apologising to my Wife and parents and telling them I would text them from the top of Carn Dearg. 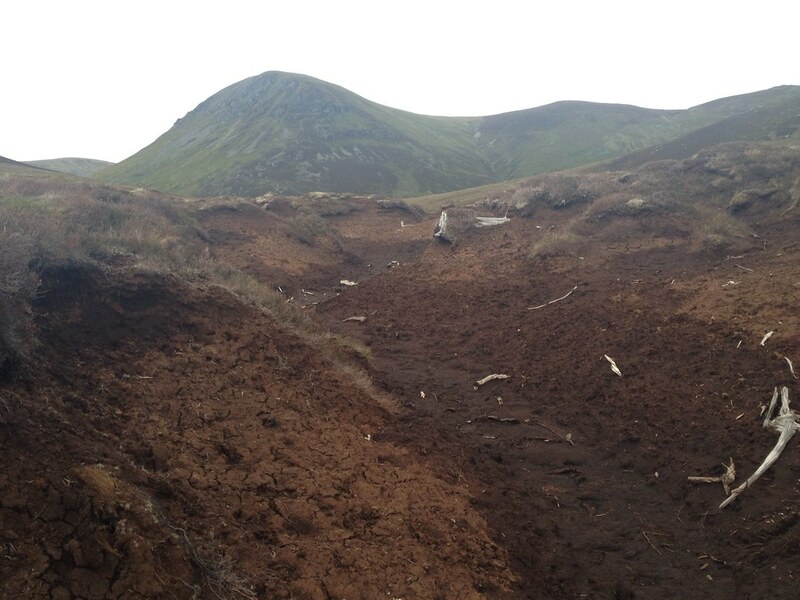 In the meantime, I had to crack on with the walk to Carn Dearg (the window between trains was just under 12 hours and I was hoping to get dinner in Newtonmore), but luckily the underfoot conditions were great for this section, save for a complete swamp at the only 850m mark on the plateau. 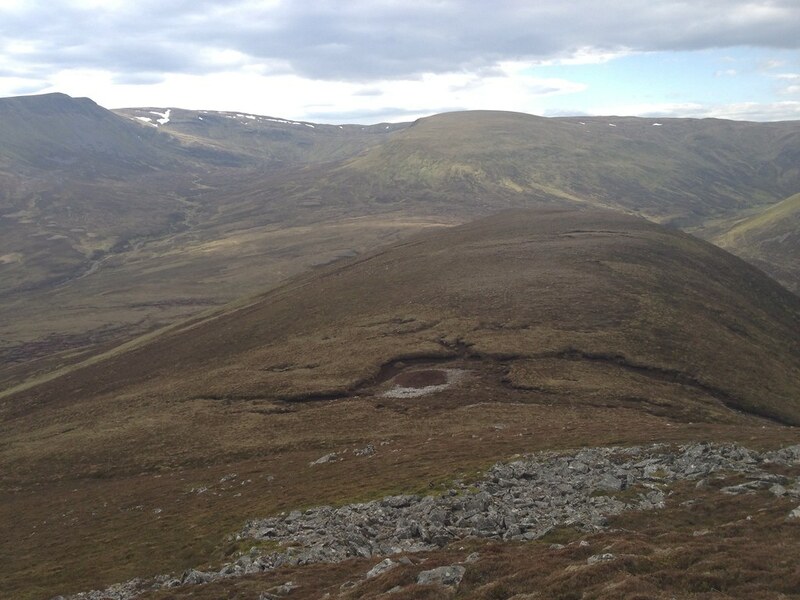 A few people complain about this section because of the large distances involved, but I found it quite refreshing to make such quick progress at such high altitude, with views opening out West towards Ben Nevis, Scurr na Ciche and Mullardoch. 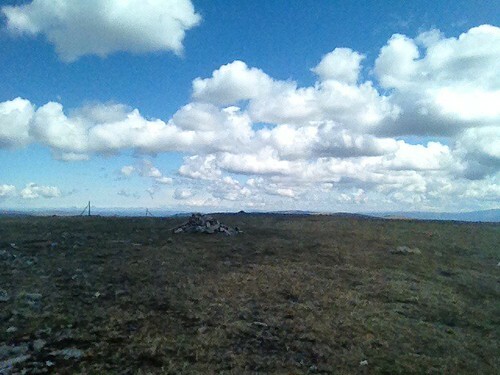 Eventually, at 3pm I reached the summit of Carn Ban, adjacent to the final Munro of Carn Dearg. I still felt good at this stage, although I shudder to think what form the Monadliath would take after (or during) heavy rainfall. I think I struck it rather lucky in that respect. In the col between Carn Ban and Carn Dearg, I found a couple of gullies of snow, eventually having to cross the second one. That was not exactly enjoyable after my horrendous experience recently on The Brack, but at least it was over quickly, and I was heading up the final pull to the airy summit of Carn Dearg. What a place. What a view. My phone was completely knackered by this point, but the view extended South towards Schiehallion, Ben Lawers and Stob Binnein/Ben More. 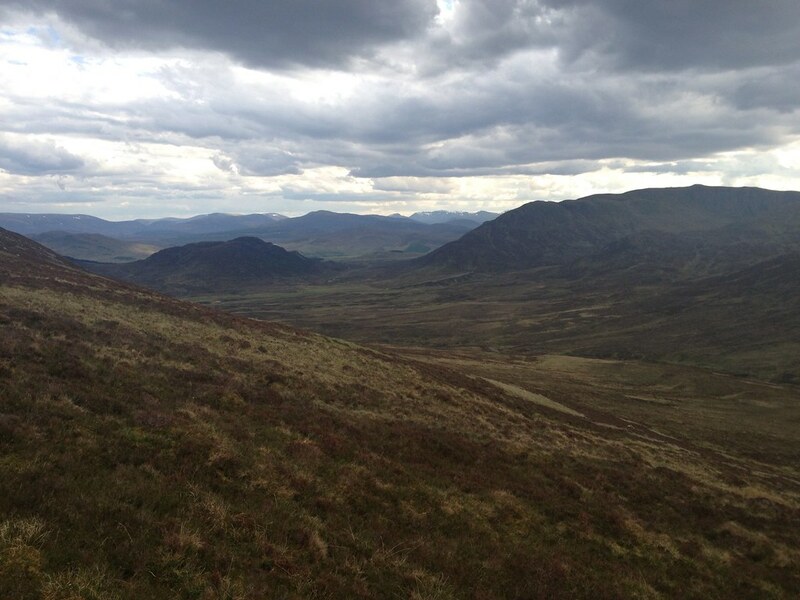 The brilliant panorama website recommended by Sgurr http://www.udeuschle.selfhost.pro/panoramas/makepanoramas_en.htm would later confirm that my last Munro, Beinn Chabhair, was even visible at the back of the Crianlarich bunch, while Ben Hope can apparently be seen to the North (I couldn't really see further than Ben Wyvis). Time was still of the essence, so I retraced my steps to the col then headed East down the wide grassy slope to the glen. At this point, somewhat predictably, I began to hit the wall energy-wise. I always struggle with descents, especially those of the long epic pathless variety, so I had to make sure to allow enough time for this one. 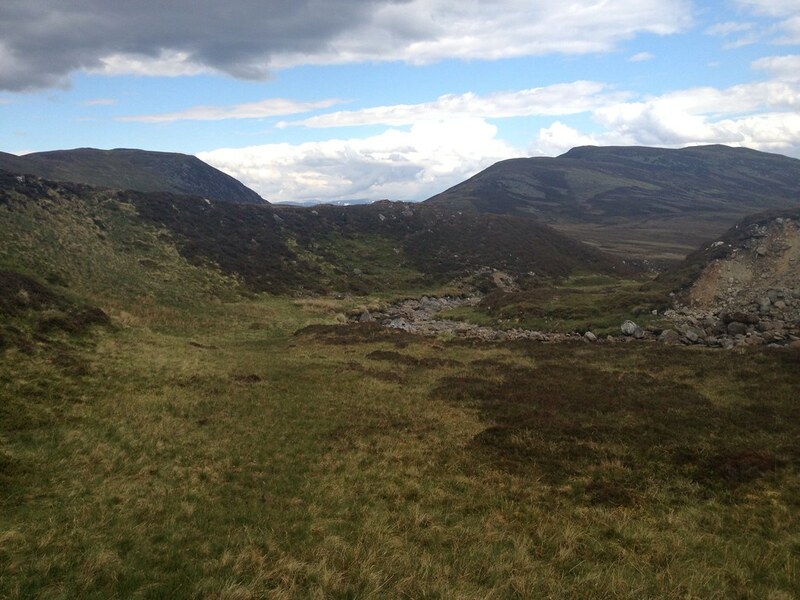 I turned right to begin a long trudge down what appeared to a slightly boggier valley. Maybe time to try the proper camera again, just for a laugh. WOAH! 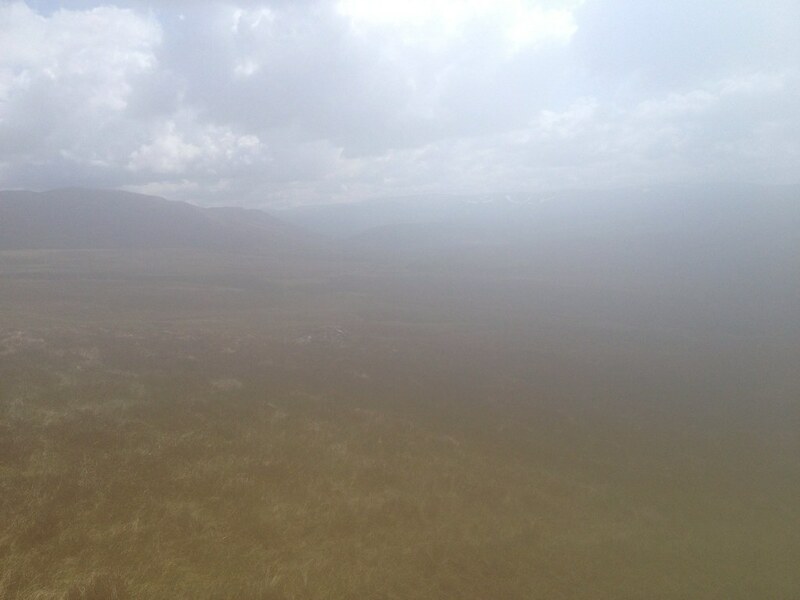 The iPhone had somehow performed a Herculean recovery on top of Carn Dearg, shaking off the steamed-up look with immediate effect. The battery was still inching towards 0%, so I attempted to keep the pace up as I careered around the valley in search of a path towards Creag Liath. Eventually I found a thin path or two, but they petered out quite quickly. 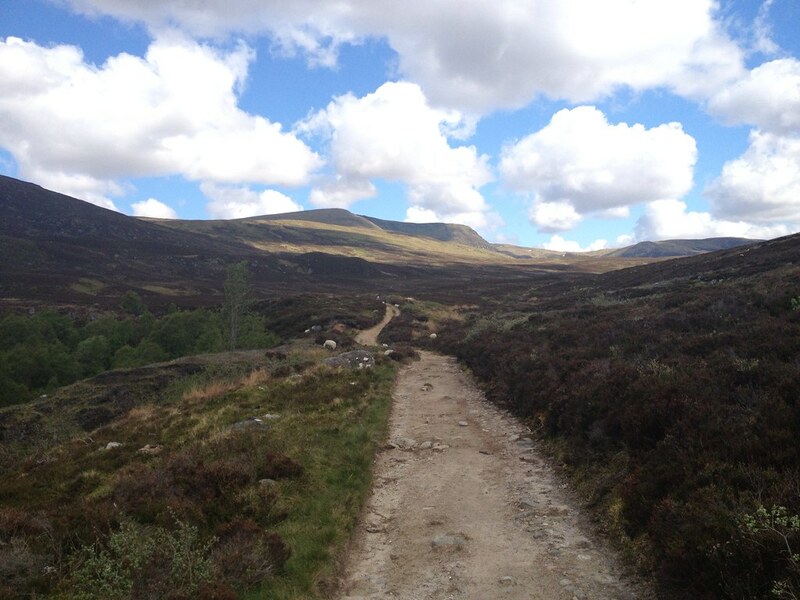 By descending to the riverbank, I picked up a path which eventually developed into a clearer track heading towards the bealach with Creag Liath. Sadly it didn't stay this clear for too long, and I lost sight of it cutting across undergrowth towards Creag Liath, startling a few Ptarmigans (who in turn startled me by flying away at the rate of knots). In fairness, I was the one disturbing them. 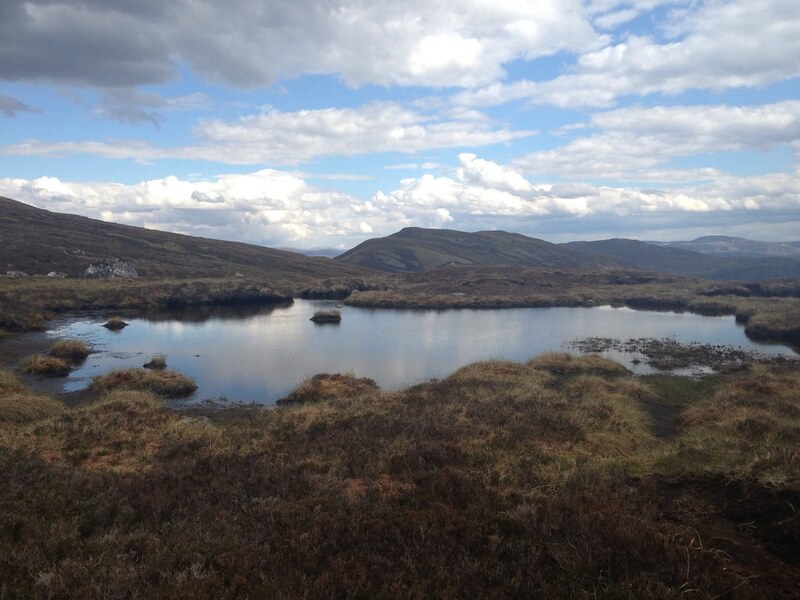 I crossed the deep peat bogs at the bealach, again wondering what on earth this area would be like on a wet day. 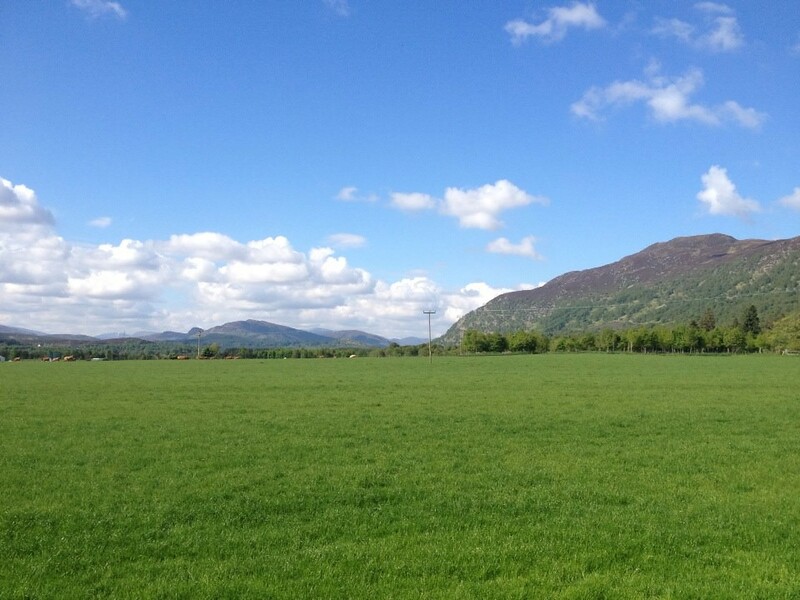 The views were excellent across the glen towards Creag na h-Iolaire. 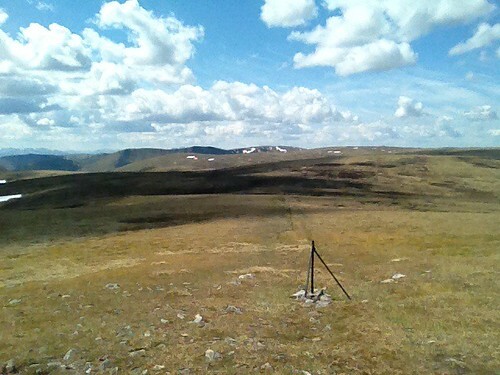 Eventually at 5pm, I reached an old fenceline and crossed a path signifying the start of the final climb up to Creag Liath. The going was rather steep here, not helped by the miles clocked up earlier, but I found a couple of horizontal paths traversing the side of the hill to the South, eventually taking one and edging up the West side towards the col at 680m. I felt like the col would never be reached, and it was some relief when I found myself on the final pull up towards the summit at 743m. A large stone lay on the brow of the hill. 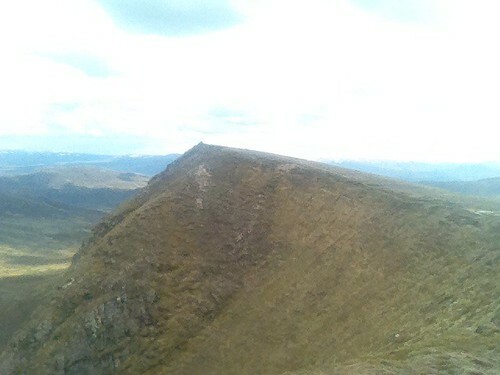 Was this another false summit tempting me upwards? It was, but thankfully the real summit was only a minute behind it. It was a remarkable feeling to reach this peak. 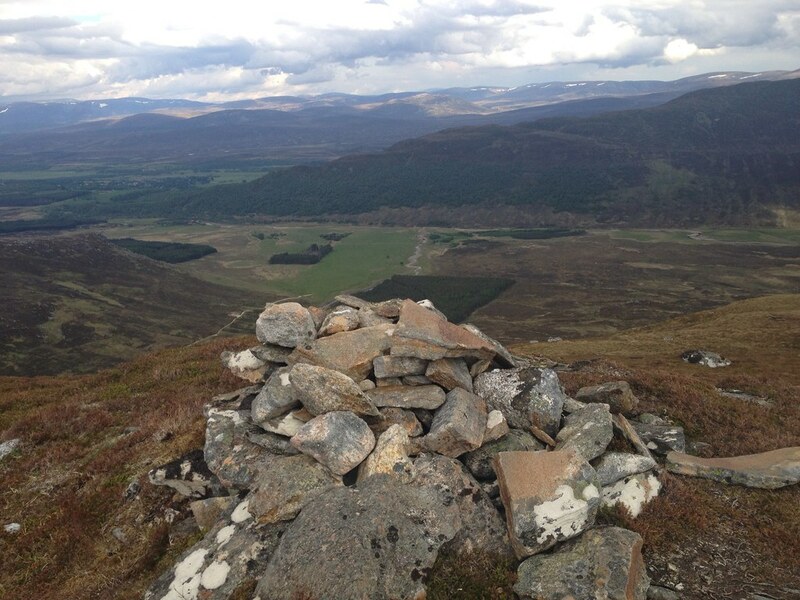 I've never climbed four new mountains in a day before, or walked for 20 miles, and while the pain was starting to show it was still a euphoric feeling to reach the last summit with spectacular views down into Badenoch and Strathspey. 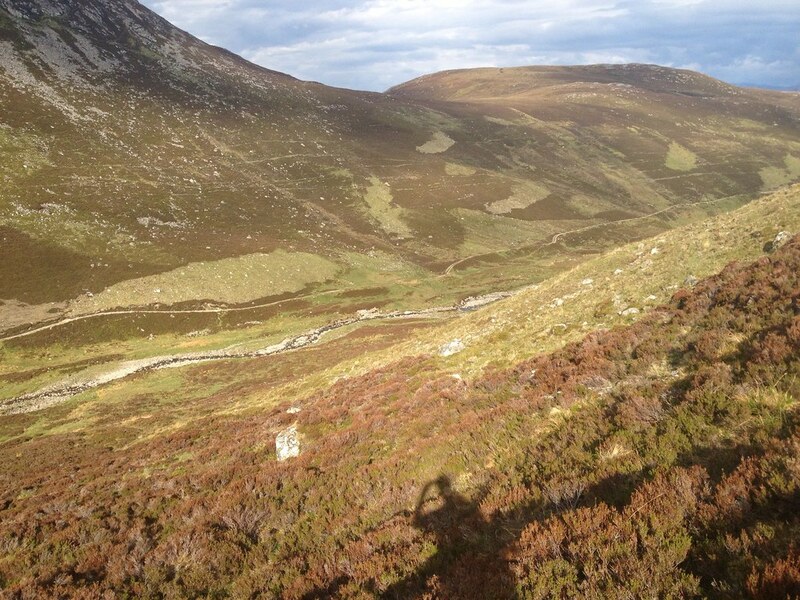 Eventually the time came to descend to the Allt Fionndrigh, following Rockhopper and Johnny Corbett's route to the bitter end. 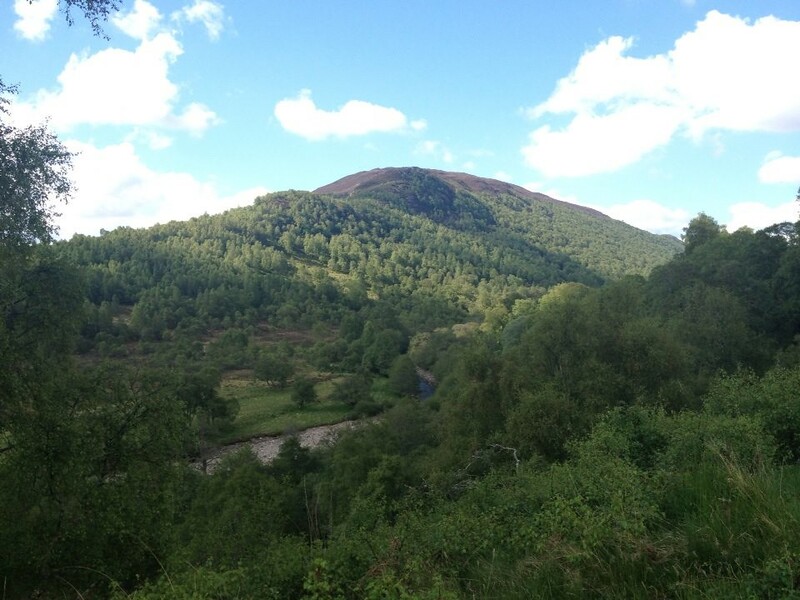 It was, as they warned, a very steep descent from the mini-col on Creag Liath, but only 250m down to the river. The sun came out once again, covering the valley in a bright glow. Aye, just a bit steep. At 6:20pm I came to the river. Oh great, just what I need, another fording. The promise of another good track and the walk back to Newtonmore lay on the other side, so I paid attention, made sure not to stand on any wet rocks and hopped over in a few seconds. Phew! 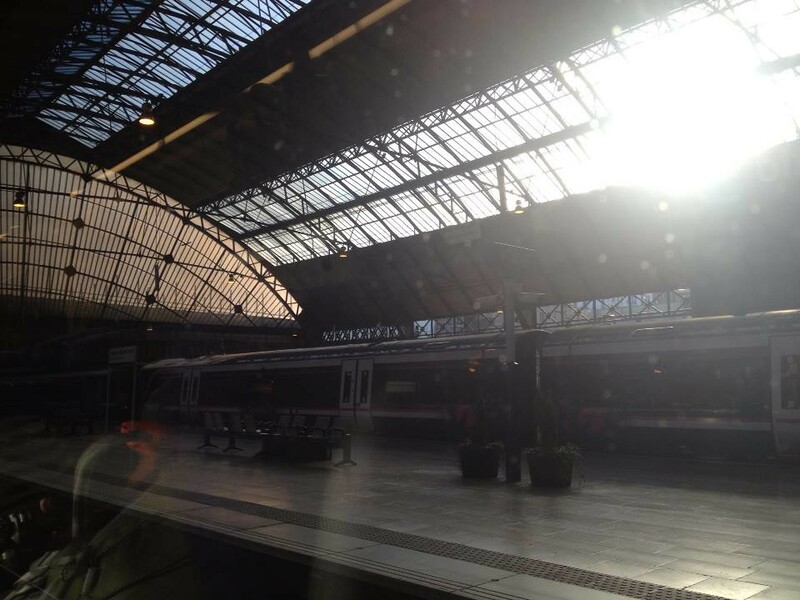 Homeward bound at last! 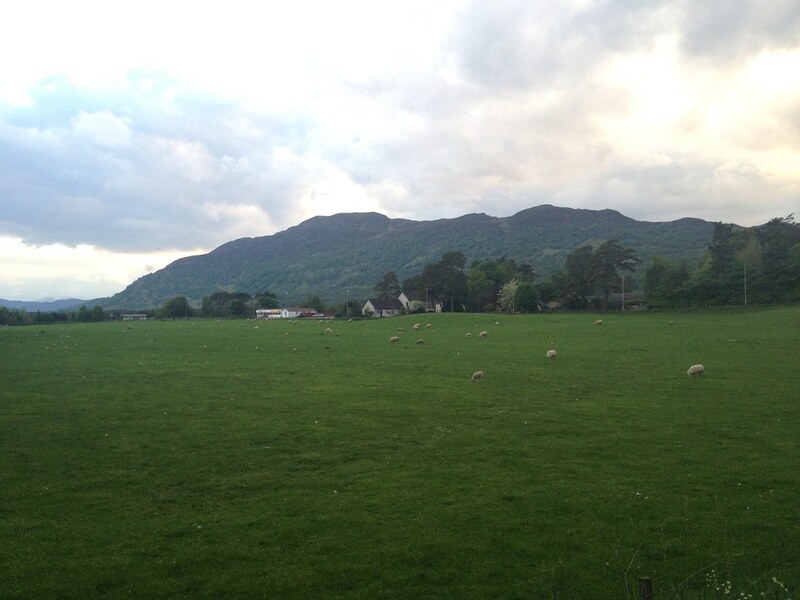 Down at Glenbanchor and Glenballoch Farm, I found an old township, now deserted. 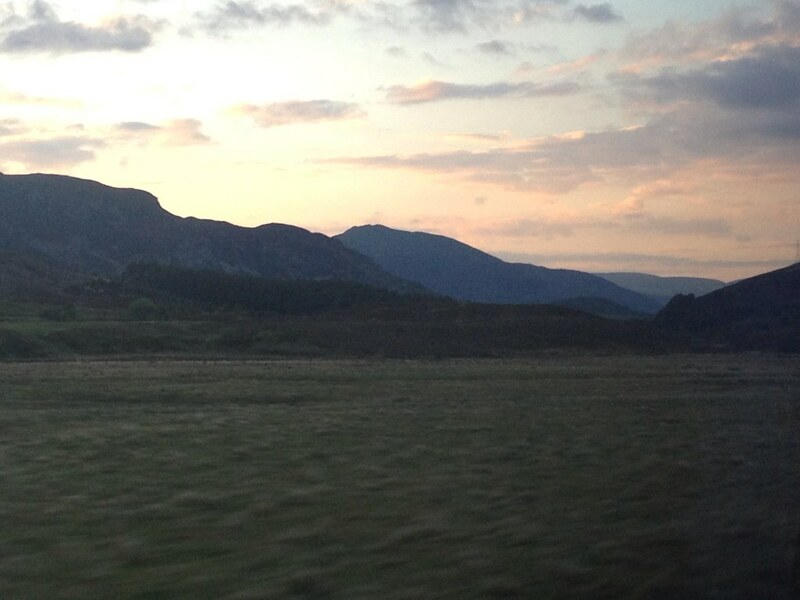 It was quite a sad sight to an entire glen now devoid of people when it used to house a decent-sized community. 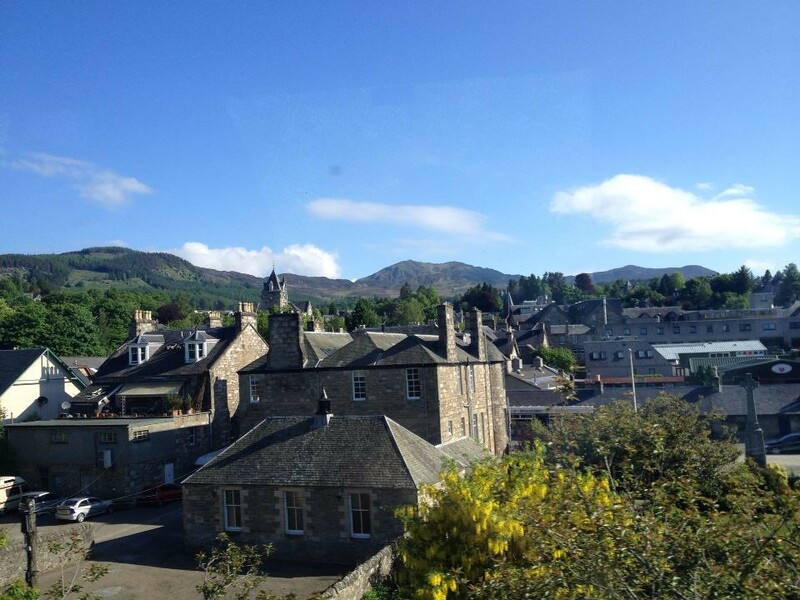 It was like stepping back in time, and was made all the more surreal by the knowledge that Newtonmore and the A9 were barely three miles away round the corner. The car park. I've still got two miles to go though! 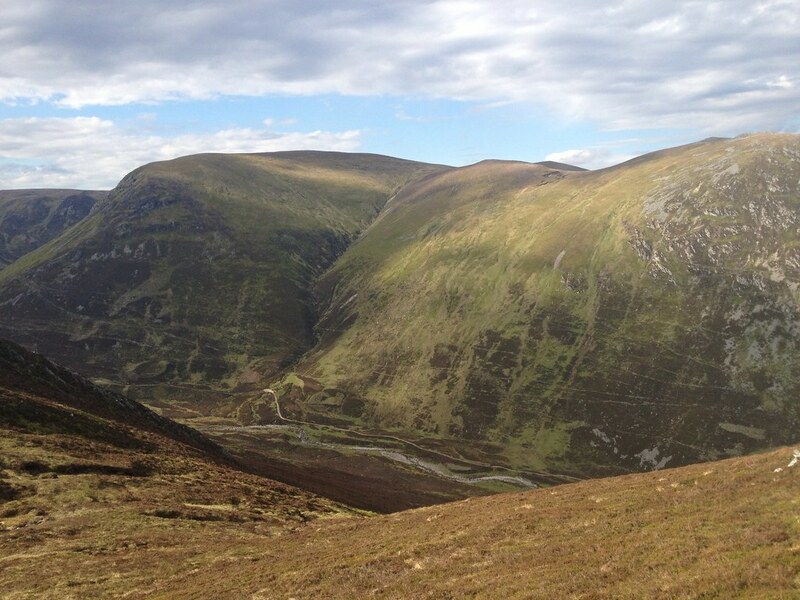 My phone finally packed in taking this photo of the view down Glen Banchor. 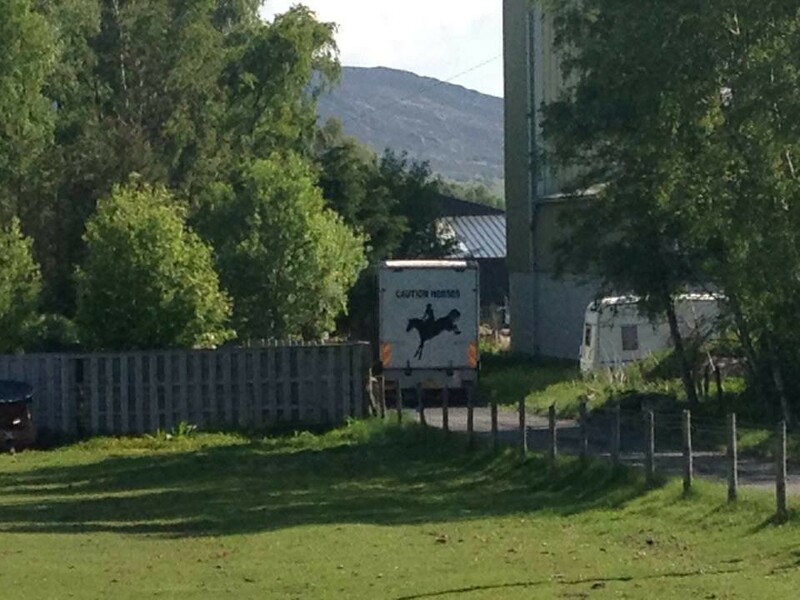 I had received assurances from an old friend who grew up nearby that the Glen Hotel in Newtonmore would offer a warm welcome and, true enough, I arrived there at 8pm to be shown to a table in the restaurant near the bar, given the greatest ever ice-cold Coke/Pepsi/whatever it was (tied for 1st place with my post-Cobbler drink in Arrochar) and allowed to charge my phone by the barman. The food took half an hour to come, but when it did it was just the ticket, and allowed me to leave at 9pm in just enough time for the train at 9:22. 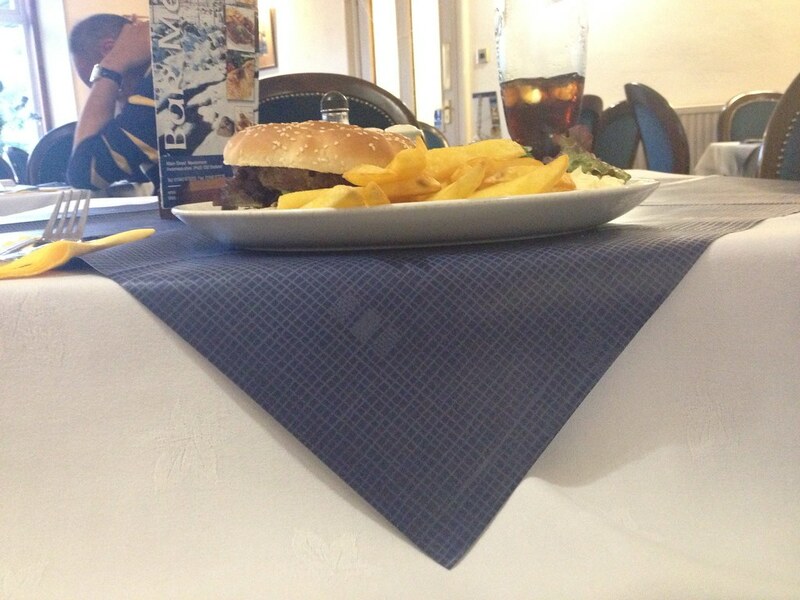 I was joined in the restaurant by the father and son from A'Chailleach. 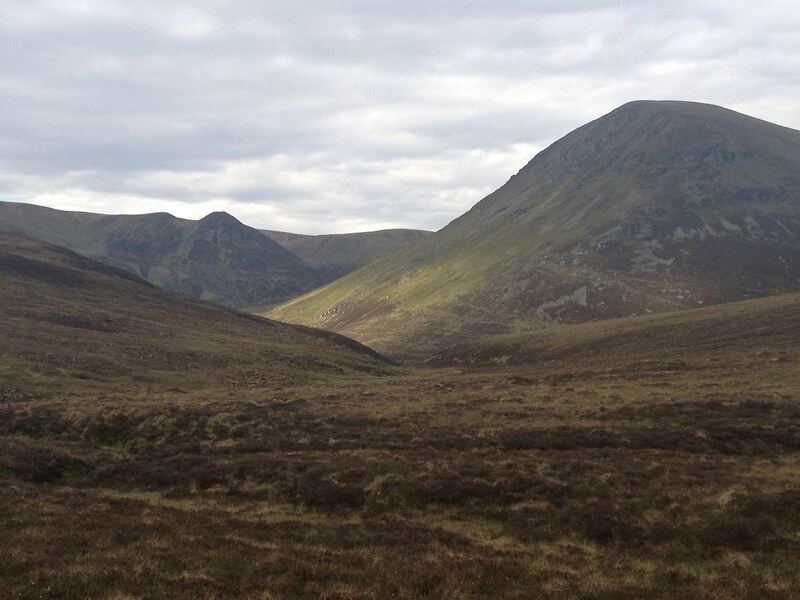 They had settled for the two Munros that day, turning back at Carn Sgulain. I said I would probably regret going all the way round the next day. Which I sure did. In the end I arrived back home at midnight, staggering through George Square in the style of most of the other inmates at that time. 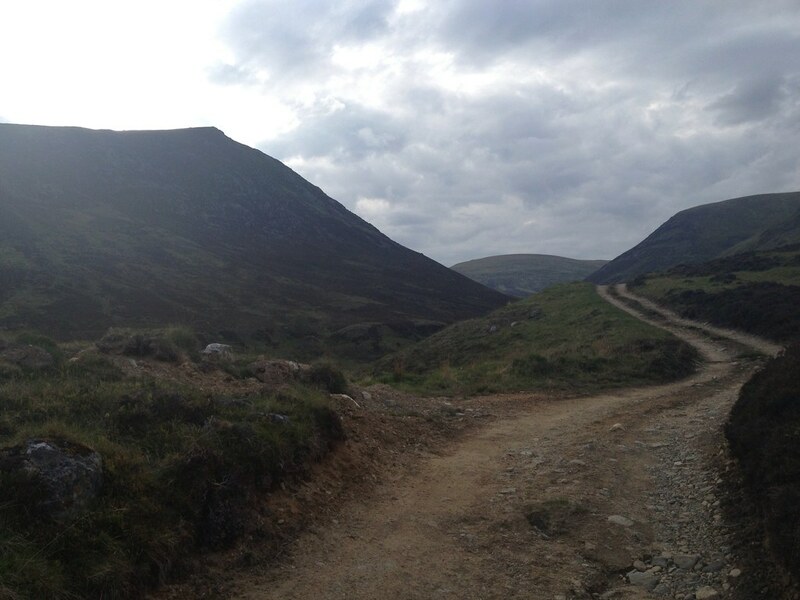 I was originally supposed to climb another hill on the Sunday with friends (potentially Beinn an Lochain ) until I received a text at Sunday lunchtime to say my friend's car had broken down. Never before have I been left so relieved by such bad news. 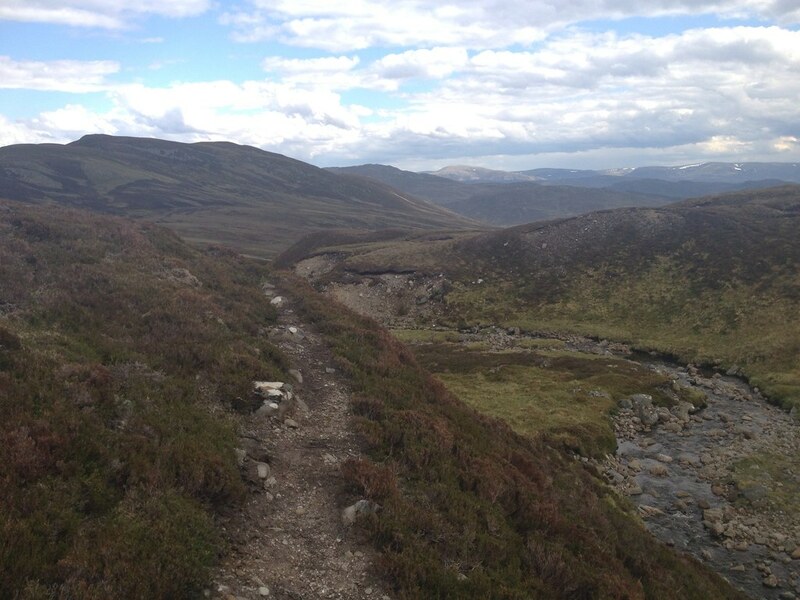 My Wife and parents were mortified at the thought of me going straight back onto the hills the day after falling into a river on a 20-mile climb of three Munros. And reading it back, that was a rather silly idea after all. 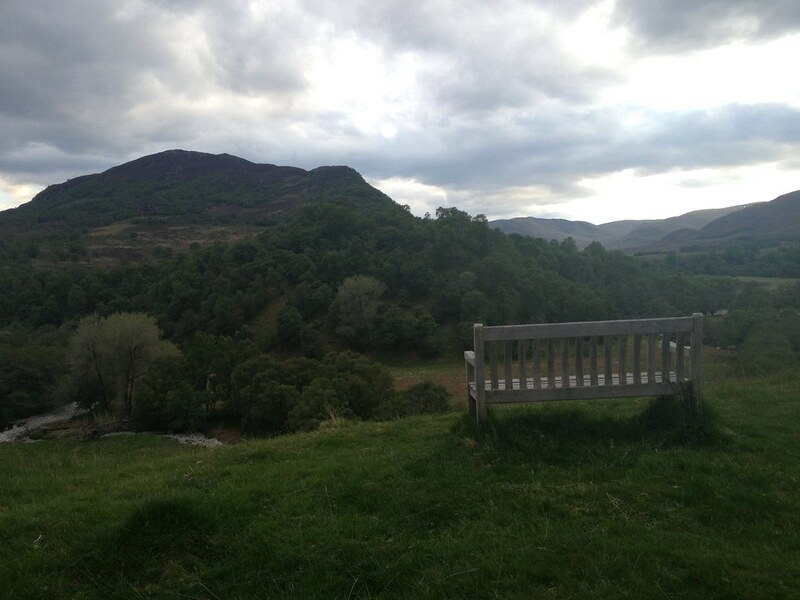 I often have one song in my head all through a hillwalk that ends up pushing me on through the day, and on this day it just happened to be Swedish House Mafia's 'Don't You Worry Child (Heaven's Got A Plan For You)'. As I lay on the bed on Sunday, I felt they were quite appropriate lyrics. I had pushed myself close to the limit the day before, and had nothing left in the tank. 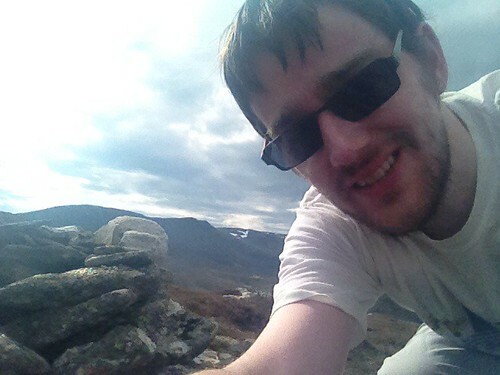 There's no telling what could have happened to me on a mountain like Beinn an Lochain. If there is someone upstairs, perhaps the cancellation of my planned hillwalk was his way of saying, "Right son, dont push your luck." Last edited by Craiging619 on Wed Jul 10, 2013 9:06 pm, edited 1 time in total. Great detailed report, full of useful practical guidance...just how I like 'em! Well done! I'm planning on doing these three this Friday (12/7/13), so hopefully with this fab weather we've had recently, the bog factor will be considerably less than you experienced.